I decided it is time to add a fleet to my roster. These will serve from the coal dock to local industry. Looks like I have enough Kadee couplers but where did I put the height gauge?!! Fine example of what can be done with those cars. Very nice work Neil. Thanks Chris. Pretty much “shake the box” except for the modifications for Kadee couplers. Nope ...I like them just how they are. I would beat them up and make them look used but that's just me ! If they ain't beat up, they ain't makin' revenue. Yes-siree...a set of metal wheels; a conversion to Kadee body mount couplers, a coat of paint, and if wanted, a number and reporting marks does wonders. Did you pick those up used? Our second hand market on O'ahu has ridiculous prices! BTW, I haven't used mine in a while and they have not been making revenue either. Maybe time to pass them on. I have 9 of these all with SanVal wheels and truck-mounted Kadee G-scale couplers. All appear to have been "well used" and weathered with Floquil/air brush. All have loads and IIRC a couple have big speakers (~4") mounted under the loads with miniature connectors to attach to the engine. I also have at least one still in kit form and a couple of the smaller Hartland gondolas, also beaten and weathered with SanVals and Kadees. I would take $600 for the 12+ pieces, but i don't have the boxes and don't want to ship them. I'm in Orange County, CA. Thanks guys. They were a bulk purchase of four kits. I enjoy this kind of thing! ... I enjoy this kind of thing! as can be seen in the result! Best of luck. 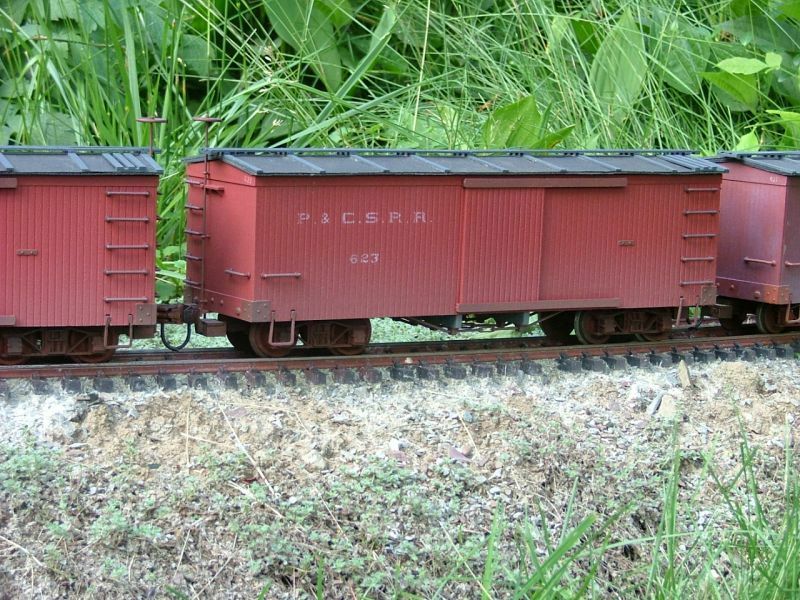 Bachmann hasn't offered those kits for 10+ years, though you can occasionally find them in yard sales. Gee, I thought that they were going to reintroduce them. That's a shame that they didn't. They did "Reintroduce" many of the cars in kit form, although it was a number of years ago. They were in grey boxes. In fact a lot of us went after them for the reintroduction. The sad fact was, just as was predicted by B'Mann...the demand just was NOT there, except for a few of us who used the opportunity to enhance our fleets. The truth was, that it cost B'mann almost as much to produce the kits, as it did to produce the cars as ready-to-run, where the demand was increasing. 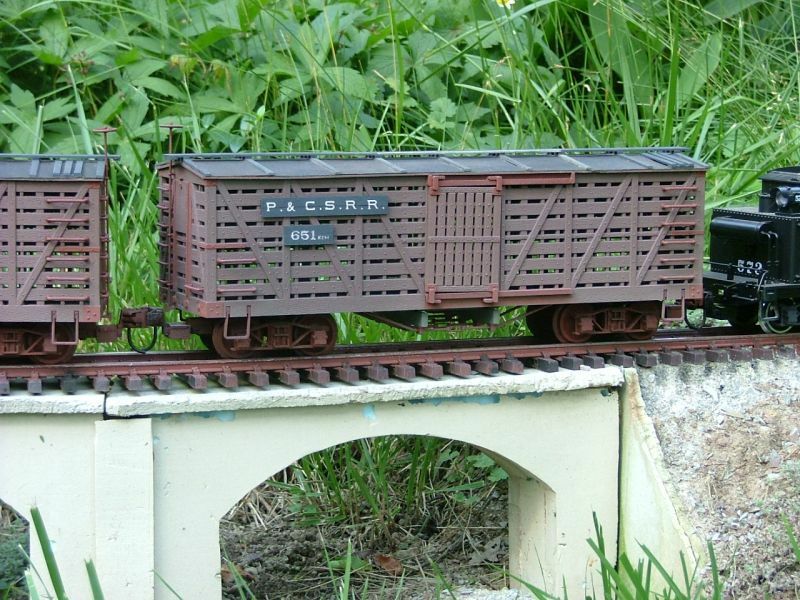 The model train market has changed, as have just about all hobby markets. Who builds a model aeroplane these days, when they can go to a big box store and grab a fully equipped plane, ready to fly...just add batteries...find them in isle 23, beside the paper clips...!! Fred, yea, you are right. Not many builders left out there. Mine were disused, abused cars that I stripped, flipped the door tracks around on, and repainted.